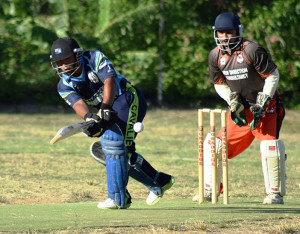 Island Boys have their eyes set on one goal—being the team that is promoted to the Premier Division at season’s end—following an emphatic victory over the Wolues in the BVI Cricket Association LIME Twenty 20 league competition in Division I play on Sunday in Greenland. Island Boys systematically dismantled the Wolues, whom they bowled out for a paltry 57 inside 12 overs, with Charlie Jackson the only batsman reaching double figures with 20. Man of the Match Wayne Phillip ripped through the Wolues order picking up 4 for for 13 and Xavier Turby also bagged 4 for 19 in a run through the fragile batting line up. In reply Gregory James smashed his way to an unbeaten 39, including 5 fours and 2 sixes, to bring home the victory, by nine wickets from only four overs. In the Premier division clash, the Cavaliers returned to form and flogged the Vikings by seven wickets after they posted an above par score of 236 for 4. The Vikings were led by Vic Seepersad’s 102 from 67 balls in setting the pace. He had a knock of 11 fours and 4 sixes, during a 122 run partnership with Ken Alphonso who notched an even 50, seemingly put the Vikings out of reach. Mohamed Hasan picked up 2 wickets for the Cavaliers, but at a cost of 52 from his four overs. Cavaliers began their chase with the early loss of opener Dorian Auguiste. However, Kwesi Sinclair and Teddy Nankishore, put on a formidable 130 for the second wicket, before Nankishore fell for 60. Sinclair continued to batter the Vikings bowlers and reached his century (102) from 48 balls, with 12 fours and 4 sixes to secure the seven wicket win as they posted 241-3 inside 19 overs. “We had great communication out there and we knew one of us had to bat right through today and it was me and I’m thankful for that,” said Man of the Match Sinclair, who was quick to praise the all round team effort.